Gone Girl is the type of film that is right up David Fincher’s alley, the man who authored Seven, Zodiac, and The Girl with the Dragon Tattoo. Starring Ben Affleck and Rosamund Pike as Nick and Amy Dunne, the film is a seeming whodunit when Nick returns home and discovers his wife is missing on the day of their fifth anniversary. Nick, who is marked by his boyish aloofness and childish naivety, calls upon the help of Detective Rhonda Boney and her sidekick Officer Jim Gilpin. Even though he is playing the part of the cooperative husband, Nick is still suspect number one. The media swarms all over this story because Amy is not your ordinary upper-middle class white woman: She is the inspiration for her mother’s popular children’s book Amazing Amy. Faithful to Gillian Flynn’s novel, the film flashes back through Nick and Amy’s relationship. Told from Amy’s point-of-view via her diary entries, it paints a relationship consumed by passion only to have it self-destruct and deteriorate. Amy’s diary eventually becomes the key piece of evidence working against Nick’s case. What is interesting is that the words from a possibly deceased white woman can carry so much weight. I’ll elaborate more on this later. What ultimately ensues is a tangled web of twisted lies and unsound narrative. Much of the discussion that has polarized the film is the idea that Gone Girl is an anti-feminist work that revamps gender stereotypes. Specifically, Gone Girl has been compared to Fatal Attraction. The latter is a pivotal film in Reagan’s America because it works as a reinforcement of the family values Reagan preached about during his administration. Fatal Attraction represented the decade-long Hollywood trend of making good women out to be the subservient “bland housewife” and the single workingwoman as the female villain. These films became morality tales where family, marriage and the good housewife always came out on top. It is through this prism that Gone Girl has been unfairly dissected. While Amy falls short of tossing a white rabbit into a pot of boiling hot water, critics have argued that Amy’s unhinged personality and unreliable narrative maligns women while positing the male as the empathetic hero. While I can agree the film teeters on misogyny, it is a serious misreading if one were to interpret the film as a revamp of 1980’s feminist backlash. As a matter of fact, critics are not giving enough credit to Amazing Amy. Gone Girl is meant for David Fincher. However, unlike his previous films, Nick is not particularly a strong male protagonist. He’s a klutz who is always a step behind everyone else. Only after he hires Tanner Bolt (Tyler Perry), a hotshot defense attorney, does Nick manage to play the game. Fincher, who directed numerous music videos with artists such as Madonna and The Rolling Stones before debuting his first feature at the age of 30, is considered by many to be a prodigy. It should serve as no surprise that characters like Mark Zuckerberg and Lisbeth Salander are in many ways a reflection of Fincher’s own genius. If Nick does not fit the bill of a genius, then who in the film can serve as Fincher’s alter ego? 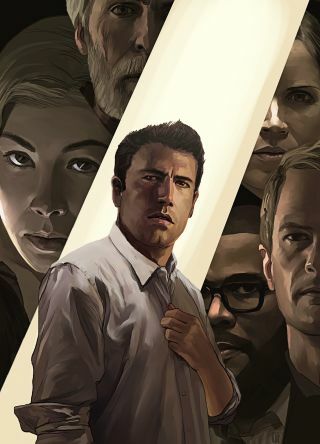 Like Akira Kurosawa’s Rashomon, Gone Girl examines the reliability of multiple narrators. While Nick and Amy are untrustworthy sources, narrative is still a source of agency. No character possesses more agency in driving the film forward than Amy. Amy’s attempt to construct, control, and design her narrative is no different from the obsessive style of filmmaking Fincher is notorious for in the industry. Both are driven by madness. Though seemingly psychotic, Amy is always a step ahead of everyone in order to fulfill her goals by any means necessary. And unlike Fatal Attraction, Amy’s madness isn’t used to destroy a marriage, but to rebuild her own. By subverting that trope, Fincher also deconstructs the notions of marriage, feminism, and whiteness. In a pivotal scene near the end, Amy is pitted against Detective Boney. It’s one woman’s word against another’s. One is an attractive blonde who considers having a settled life with a loving husband to be a life achievement. The other is a less-attractive workingwoman who is exceptionally good at her job. Yet, Amy prevails. While critics read this as reinforcement of the “good subservient housewife,” which Amy is not, they forget to critique the societal forces that favor and condition the Amys of this world. The discourse shouldn’t be on feminism, but on the media and the coddling of white womanhood. Fincher’s focus on the overly conservative media is indicative of how societal norms, i.e. womanhood and marriage, are often formed and protected. Amy’s words are so sacrosanct that her diary gets treated as scripture. Ironically, this comes back to haunt Detective Boney when her own colleagues overrule her words in favor of Amy’s. What is ultimately brilliant and twisted is that Amy is not a Victorian woman. Her madness is the mirroring and result of the constant dissemination and protection of white womanhood that remains prevalent today. Like Fatal Attraction, Gone Girl is still a product in Reagan’s America. Gone Girl is Fincher’s 10th feature film and it is one of his best. I would rank his top five as such: 1) The Social Network 2) Zodiac 3) Seven 4) Gone Girl 5) The Game (apologies to all you Fight Club fanatics). Since Zodiac, Fincher’s style has been simultaneously reserved yet distinct. I believe Fincher is at the pinnacle of his career. As highly regarded as Seven and Fight Club are, these two films reveal a young man unable to cope or figure out his societal anxieties, such as crime, death, advertisement, and capitalism. While Fincher remains cynical and ambivalent to this day, his recent films reveal a more contemplative filmmaker. He doesn’t seem eager to find answers to his questions. He is simply focused on asking the right ones.